Karen Trujillo, Gov. Michelle Lujan Grisham’s pick for secretary of public education, speaks during a news conference Thursday, Jan. 24, 2019, in Santa Fe. New Mexico’s moonshot for education finally has someone permanent at Mission Control. Gov. Michelle Lujan Grisham on Thursday named Karen Trujillo as her secretary of education, along with a diverse leadership team that has as its mission transforming the state’s beleaguered public school system to educate children better — and finally erase the achievement gap for at-risk students. The New Mexico State University education researcher and newly elected Doña Ana County commissioner has two credentials whose lack dogged Martinez appointee Hanna Skandera — she’s a native New Mexican and spent years at the front of a classroom. And she and her husband, Ben Trujillo, sent their three children to public schools. She also struck a different tone than former governor Susana Martinez’s education secretaries. She spoke of listening to what communities and schools want instead of telling them what to do. The real question is: Does she have the right stuff? Is she the transformational leader that educators and parents are looking for after eight years of testing and accountability-based reform under Martinez? 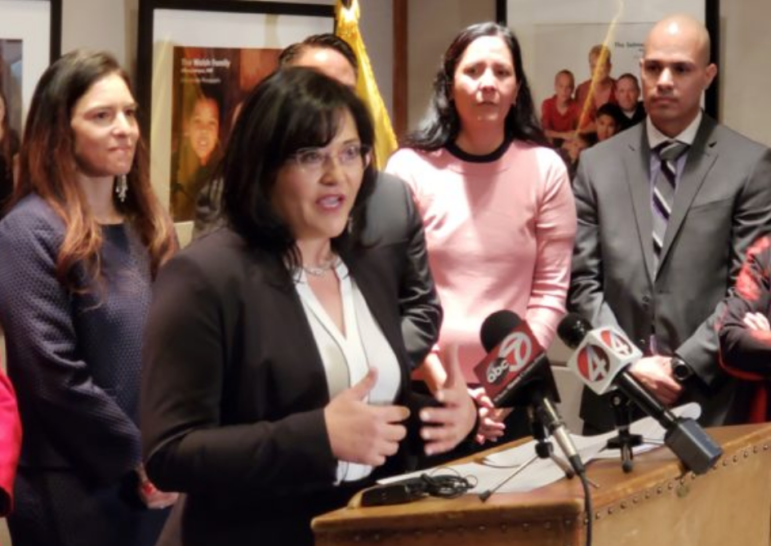 “The best word I have to describe Dr. Trujillo is thoughtful,” said Edward Tabet-Cubero, director of the Learning Alliance of New Mexico who is also part of a coalition that formed out of the Yazzie Martinez education lawsuit called Transform Education NM. He said her strengths include supporting community-driven education efforts through her research and a humble leadership style that means she’ll be receptive to the expertise of her deputies and advisers. “I couldn’t think of a better lineup to lead our Public Education Department than the team that was announced today,” Tabet-Cubero said. Sen. Bill Soules, D-Las Cruces, has known Trujillo since her early days as a teacher in the Cobre schools and has followed her career. He said she was not the type of leader who would look for a knight to ride in on a white horse, but instead would use a “New Mexico style” to remake schools. He cited her work in quantifying New Mexico’s teacher shortage and bringing Educators Rising to New Mexico and helping it grow to more than 40 active chapter at high schools and colleges throughout the state. It’s a career organization similar to FFA that encourages students to pursue careers in education. As director of the Southwest Outreach Academic Research Lab at NMSU, Trujillo put out the annual educator vacancy report in New Mexico, which found that in 2018 New Mexico was short 740 teachers, a jump up from 476 in 2017. Trujillo also knows many of the causes: Discouraged new teachers, half who quit the profession within the first five years, and teachers retiring at their first opportunity. In addition to Trujillo, Lujan Grisham named four PED deputies and the agency’s chief of staff, as well as a consultant to the PED – Pedro Noguera – a UCLA education professor and director of the Center for the Transformation of Schools. Kara Bobroff, deputy secretary, an education veteran of nearly 30 years, is the executive director of the Native American Community Academy Inspired School Network in Albuquerque, which she founded. In addition to spending 15 years with a focus on Native American education and serving Native communities, she helped create a network school scorecard to provide a more holistic view of school and student success in order to guide future educational growth. Tim Hand, deputy secretary, who has worked both as a teacher and in administration, most recently served as the deputy director of the New Mexico Legislative Education Study Committee. Prior to that, was the chief of staff for Las Cruces Public Schools and a math and science teacher for first-generation and low-income students. Katarina Sandoval, deputy secretary, a veteran educator who co-founded South Valley Academy. Currently, she is senior director of academics and school performance for the Native American Community Academy. Prior to that, she was chief academic officer and associate superintendent at Albuquerque Public Schools. Daniel Manzano, chief of staff, has nearly two decades of experience in operations for state government and public advocacy. Most recently he worked with the New Mexico Senate and previously worked for former Lt. Gov. Diane Denish.